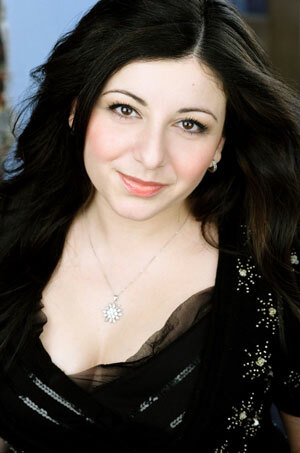 Last Sunday, Italian soprano Grazia Doronzio made her Seattle Opera debut as Liù in Turandot. As a tortured slave with a giant heart, Liù stands in contrast to the the cold Princess Turandot, and we speak to Grazia about this wonderful character and her music, below. Grazia will also sing Liù in tonight's performance, and for a final time on Sunday, August 12. To learn even more about Grazia, visit the Made in Italy Mall blog, which recently posted an in-depth interview with the soprano. For more on Turandot visit seattleopera.org/turandot. First, welcome to Seattle Opera! Could you tell us a little about your background? Well, I’m from Stigliano, which is a small village in Matera, in the south of Italy. I started to take voice lessons when I was about 15 or 16 years old, and then I went to the Conservatorio Rossini in Pesaro, and then to Rome, to the Accademia Nazionale di Santa Cecilia. After that, I did the Lindemann Young Artist Development Program at the Metropolitan Opera. What have been your favorite roles to sing, so far in your career? I think, at the very top of my list, there are three favorite roles: Liù, Mimì, and Susanna. 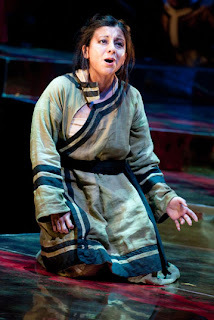 Grazia Doronzio as Liù in Seattle Opera's current production of Turandot. What do you like so much about Liù? I think Liù is real. She’s the right combination of strength and sweetness. It’s a real human being in this character. She is very strong, but she’s also fragile and sweet and very helpful. She wants to take care of everything. But she also struggles with being insecure about her situation, because of course she’s scared. Also, she loves. That’s so important for me to remember when I think about Liù. In this opera, she’s the one most capable of love. The audience tends to like her as much as you do! Sometimes she overshadows even Turandot. [Laughs] Well, I think this could also be because of the beautiful music Puccini wrote for Liù. 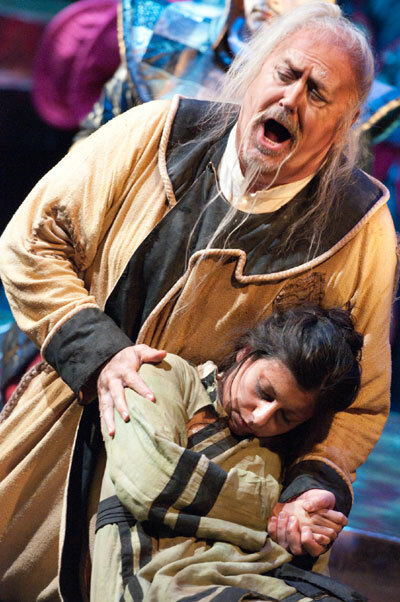 Of course, in Turandot, everyone knows “Nessun dorma,” maybe the most famous tenor aria. But I think that the music Puccini wrote for this young girl is such special music. I think the public loves Liù also because of her music. Which of her arias is your favorite? I have three beautiful arias, so it’s hard to decide! I think the most moving aria is the first one, “Signore, ascolta!” and I think the reason is because it’s the first moment—well, aside from a small phrase she says earlier—when she finally finds courage to tell him to listen to her. I think in that aria, Liù talks to Calaf not only for herself, but on behalf of Timur. 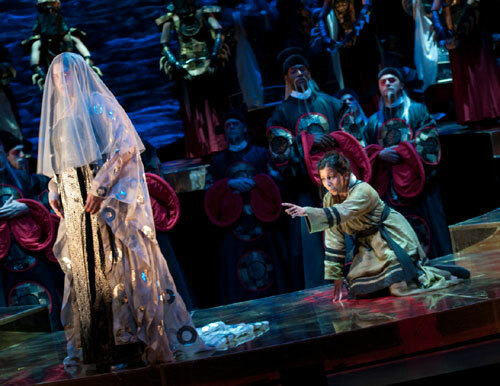 Marcy Stonikas (Turandot) and Grazio Doronzio (Liù) in Seattle Opera's current production of Turandot. Both sopranos sing their roles for the final time in this production on Sunday, August 12. 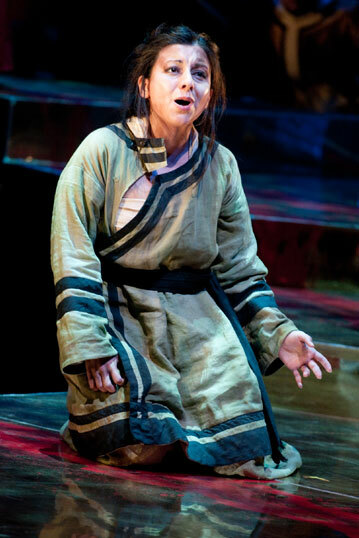 Don’t you just wish Calaf would forget about Turandot and fall in love with Liù instead? I think probably everybody in the audience hopes this! [Laughs] But it’s impossible, because of her status. Liù is a slave, Calaf is a prince. She cannot even think of it. She wouldn’t have ever dared to talk to him—so when she finally does talk to him, she knows it’s already too much. There is no hope that they could be together, considering both their statuses. So, how would you describe the relationship between Liù and Timur? She’s his slave, but there also seems to be a real affection there. It’s interesting. Timur is a king, even if he lost his battle and is in trouble now. He’s still a king. But he also needs help, and he found in Liù the only help available. She really takes care of him. She wants to help and make sure everything is fine, and she knows she’s the only one who can help him. She brings with her everything they have—the few things, the few bags—and she carries it all, and even helps Timur to walk. He is blind, so he can’t go anywhere without Liù. So this changes their relationship, because at this point she becomes a human, and not just a slave. We can actually see a huge difference in the behavior between Liù and Calaf and Liù and Timur. With Timur, she’s a person. With Calaf, she’s a slave. It’s so immediate. Peter Rose (Timur) and Grazia Doronzio (Liù) in Seattle Opera's current production of Turandot. Do you think Timur knew all along that Liù was in love with his son? I would say probably not. I think the first big revelation is at the beginning of the opera, when Timur says to Calaf, “She’s been helping me all this time when you were not with me, because I thought you were dead. She was my only support and my guide.” And Calaf is surprised and talks to Liù—suddenly, for the first time, he notices this slave—and says “Why did you do this? Why did you suffer with him?” And she says, “I’m doing this because you once smiled at me.” I think it’s at that moment that Timur understands. A very perceptive interview with this great opera's only believably-human character!! Sorry I won't get to see this interesting artist in the role, as I am in Germany. Toi, toi, toi to her and the rest of the cast! !